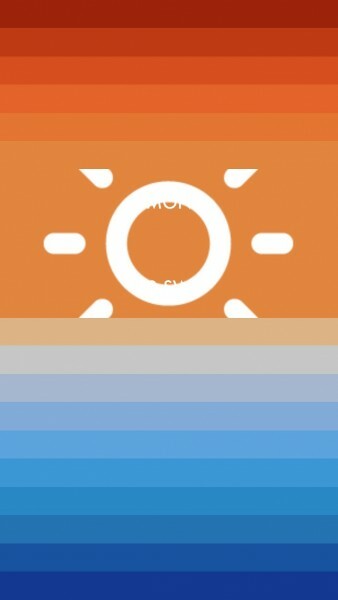 Clima ($0.99) by LittleBigCode is a beautifully colorful weather app that provides you with what you need to know at a glance. 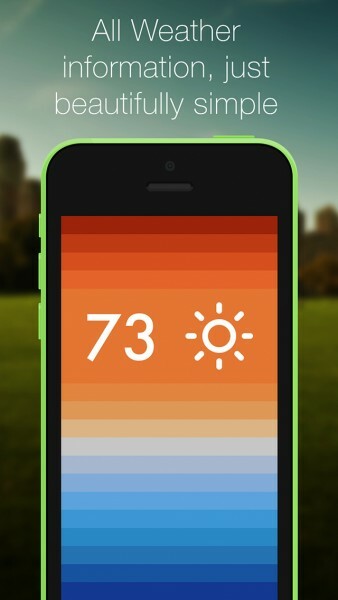 If you haven’t found the right weather app for your needs yet, perhaps Clima could fit the bill. 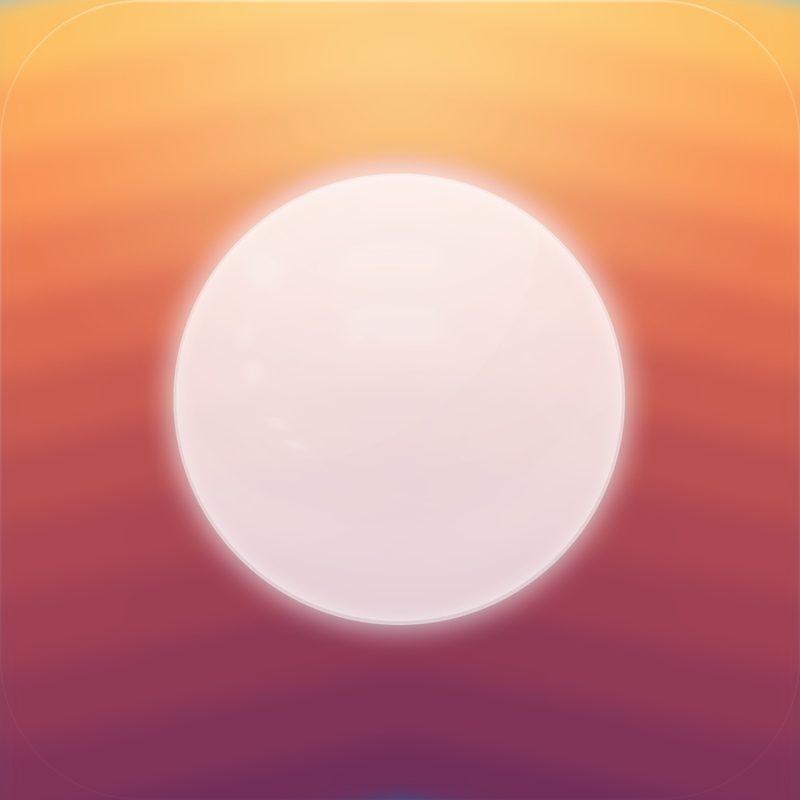 It’s similar to other apps like Haze and Solar Weather in terms of appearance. While the best way to check the weather is to look out the window or step outside, I still enjoy using all kinds of weather apps. I’ve gone through many, including Solar, Haze, Perfect Weather, Weather Line, and more. 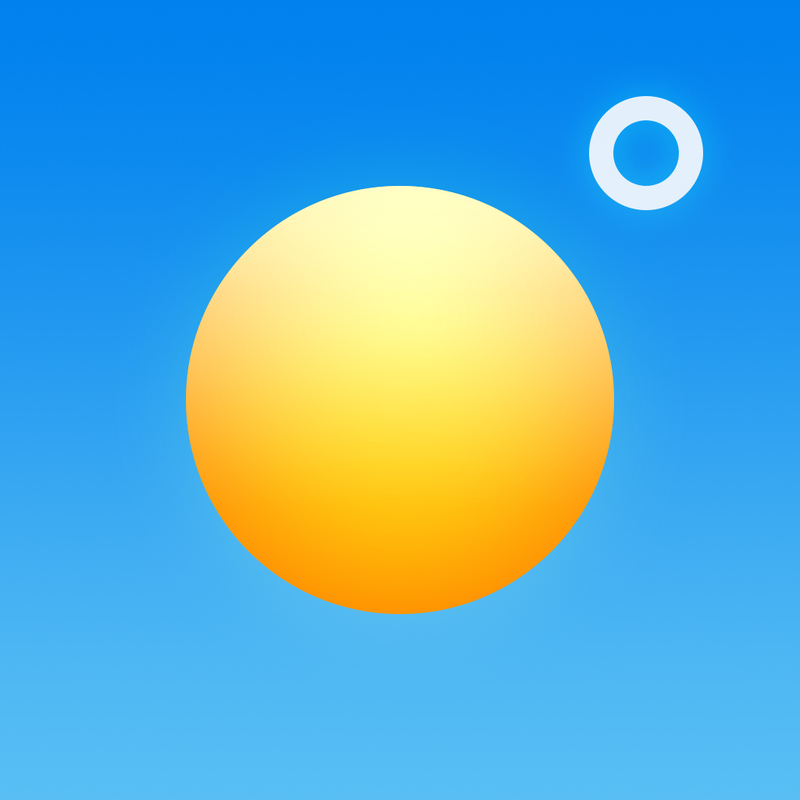 My favorite at the moment is Weather Line, because it provides the most information in one screen, makes it easy to change location, and has been accurate. 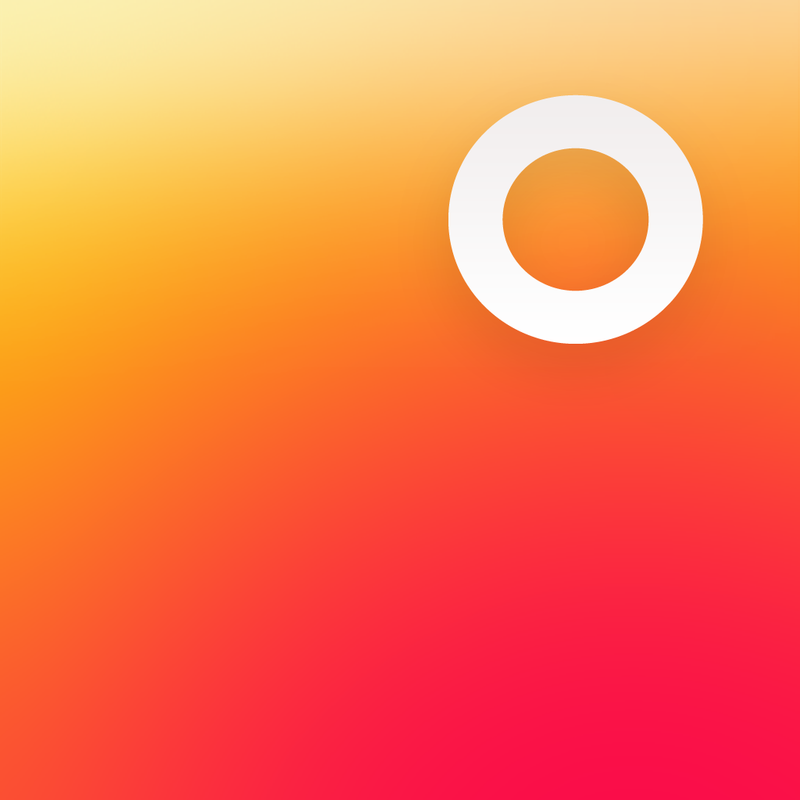 Despite this, I love checking out new apps, so I was intrigued by Clima as it was featured on the App Store. The design of Clima is eye-catching with the elegant simplicity and colors. 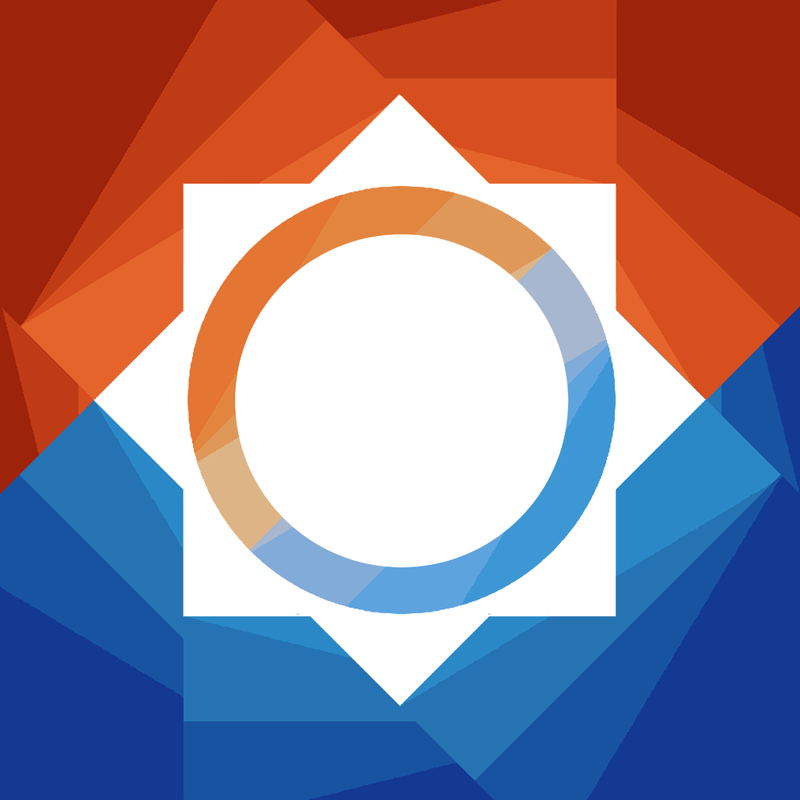 The background gradient goes from brick red to deep blue, and splits up each individual color into a thin bar that represents a certain temperature range. The sans-serif typeface in Clima is easy to read, and the icons make it easy to recognize the current weather conditions from a glance. 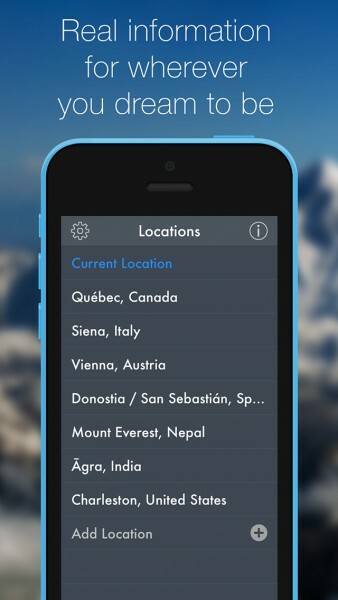 The app makes use of natural swiping gestures to get different kinds of information on the screen. When the app launches for the first time, you’ll be prompted for your current location, and then the app will show you the basics of how to navigate. 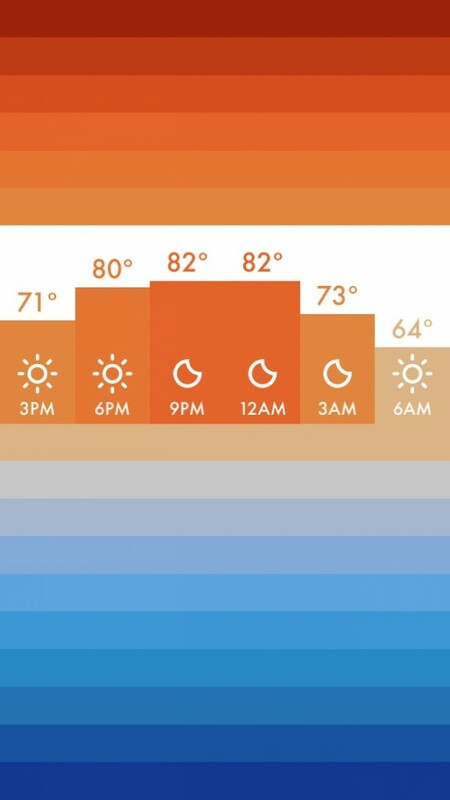 The main screen will be the current temperature for where you are right now, which is shown in the center of the colored bar that symbolizes it. 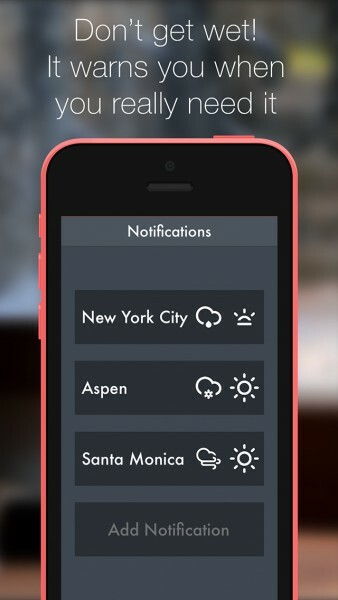 Tapping on it will show sunset and sunrise info, cloud coverage, precipitation chance, and wind. 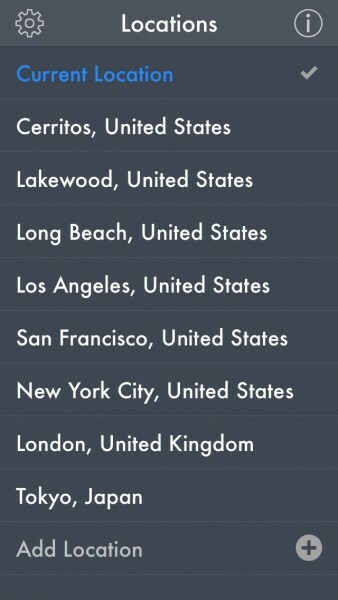 If you pull the screen down, you can add more cities and choose the one you want to display the weather information for. There is no limit to the number of spots you can save. You can also access the settings from here, which include choosing between Celsius and Fahrenheit, as well as distance measurements for wind. A swipe up on the current temperature screen will bring up the notifications view. From here, you can create a new alert when there are severe weather conditions, such as rain, snow, and temperature changes. 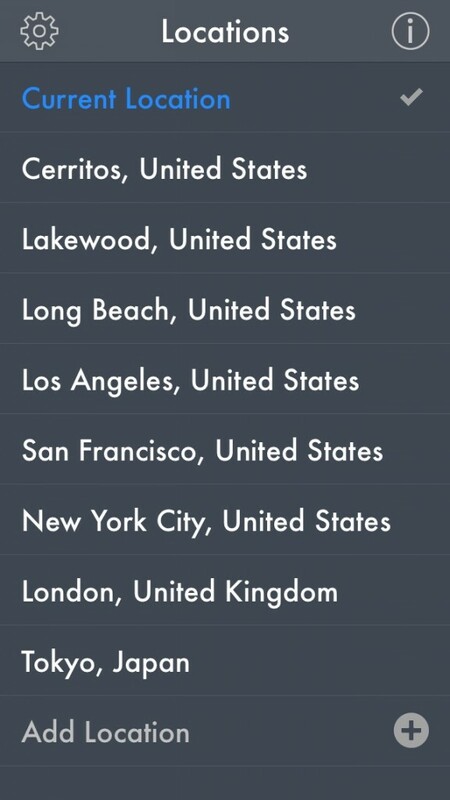 Select the one you want, choose the time, and then pick the location you want to be notified of (from your current cities or you can add a new one). 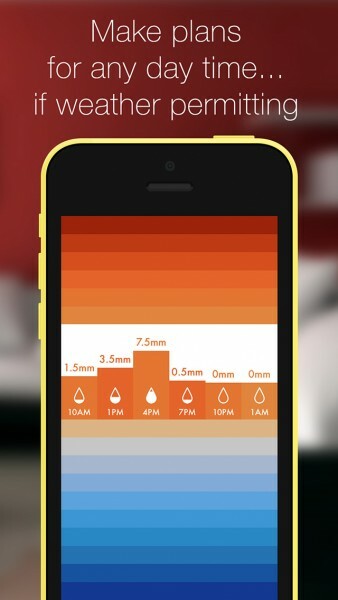 Going back to the main view, you can swipe to the right for an hourly chart of temperature, rainfall, and wind. A single tap will go through these three views. Now, usually I think of hourly as every hour, but Clima will only show every three hours, due to limited screen space. 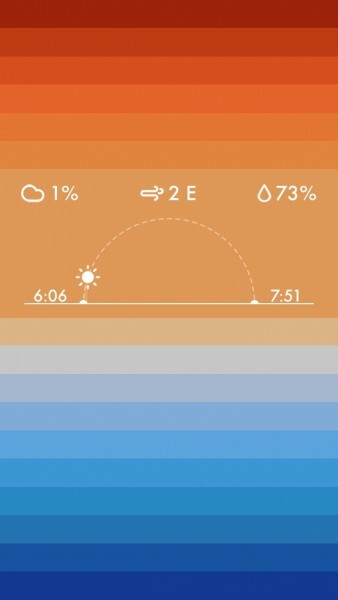 Swiping to the left from the main view will bring up the daily forecast, where you can switch between temperature and wind. However, I had a problem with this view, as it shows a large white icon in the background, and the text is also white, therefore making it impossible to see the information displayed. This was a poor design choice, and I would like to see the developer change the text color in an update so you can actually read it. 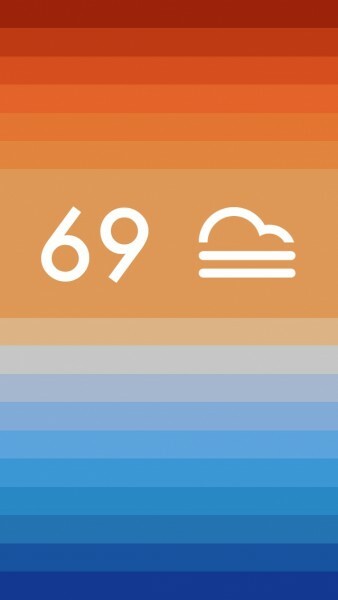 As I was testing this app out, I compared it to Weather Line and the default iOS weather information. 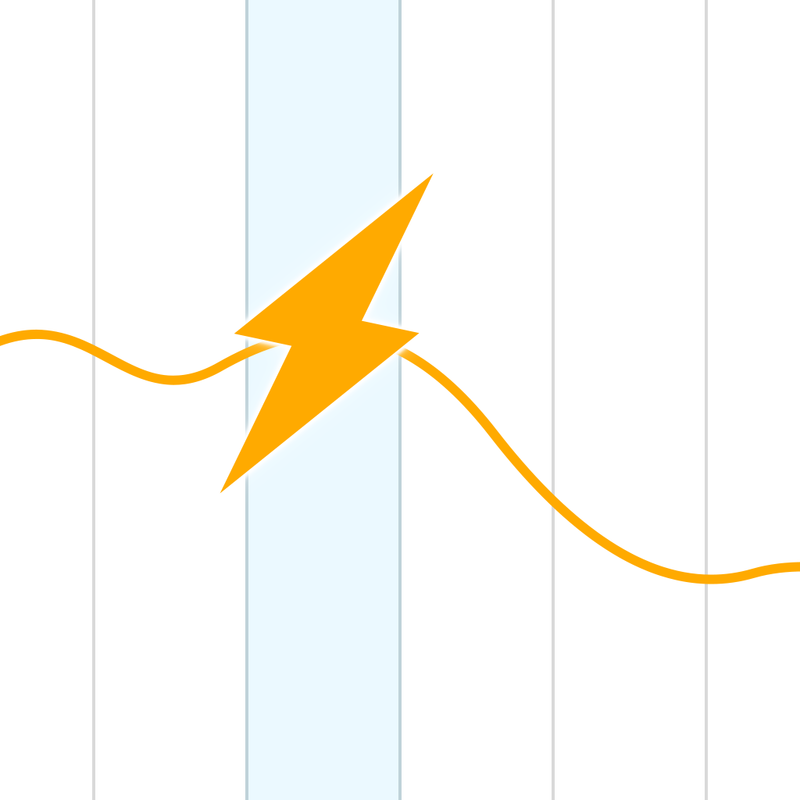 While Weather Line is only about two degrees off from the native iOS weather, Clima was off by around five degrees. I’m not sure what database Clima is pulling the data from, but it looks like it isn’t as accurate as other apps at the moment. 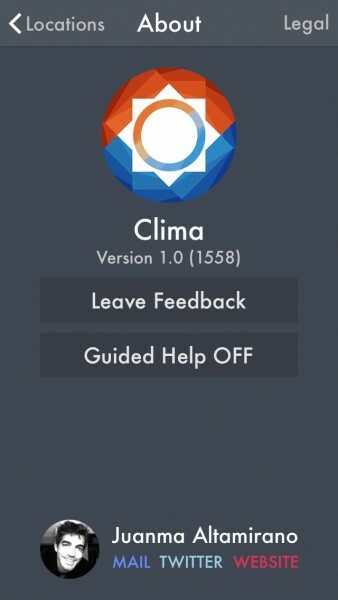 I wanted to like Clima, but aside from the pretty design, the app is lacking a bit and needs some improvement. It should be able to display information for more than one city at a time, and the text on the daily forecast view needs to be contrasting against the icons. 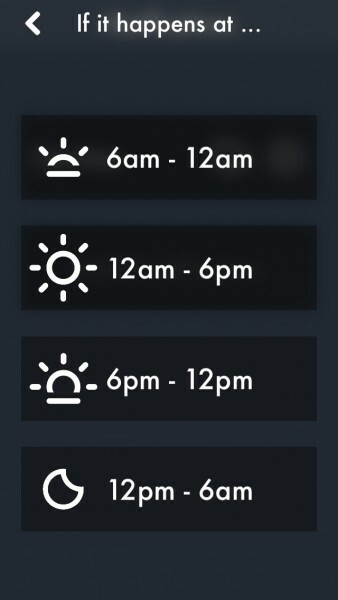 I also noticed some typos when you choose the time for a notification, as it seems that some of them should be “a.m.” instead of “p.m.” and vice versa (based on the icon showing the time of day). The information in Clima is also not as accurate as it could be, so I hope that’s improved in the future. 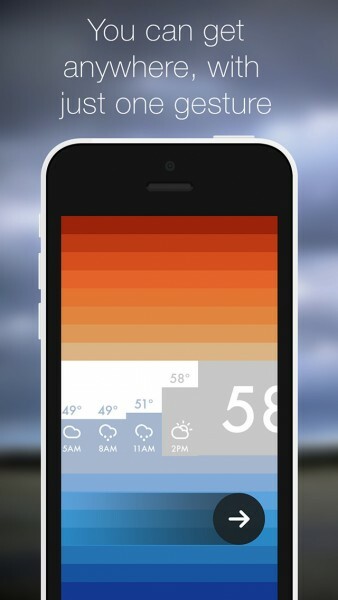 If you’re still interested in checking out Clima for yourself, the app can be found on the iPhone App Store for $0.99.